Photography has changed the way I see the world around me. Through it I discover new things and rediscover old ones. Like my island, New Caledonia. This blog is just me sharing my world through my photography. Today we do only one thing. The Tongariro Alpine Crossing. A 19.4 kilometre hike. Thank goodness for the early night on day 9 because we had to be ready and waiting the shuttle, that would bring us to the start of the crossing, by 6 am. Shuttles to and from the car parks are provided by most of the areas’ hotels and campsites as parking is limited to 4 hours at the alpine crossing. The crossing doesn’t loop so unless you’re a super athlete, there’s no way you make the 19.4 kms AND back in that time. I think it took us 7 hours to complete it. One way. So book a shuttle in advance. Tongariro Alpine Crossing starts at the Mangatepopo carpark and ends at the Ketetaki carpark. It is well managed and accessible to everyone. The young and the old as long as you’re in good physical shape. I saw an 8 to 10 year old kid and a lady, at least, in her sixties on the hike. The terrain changes constantly along the way. Starting with low lying brushes, streams, a moist environment to a very rocky and dry earth. Then desert-like as you reach the craters. Made me think of Mars, I don’t know why. It must be the movies. Very loose, rocky earth after that as you climb the steep hill before arriving at the summit. This is where my iPhone gave out on me. It wouldn’t stay on for more than a couple of seconds before shutting off completely. I’m pretty sure it was the drop in temperature. Hence no video of the most crucial time. It was the beginning signs that my battery needed replacing. Anyways, once you hit the summit, all your efforts are compensated by the beautiful Emerald Lakes. Three lakes, three different colours. Magnificent! And, of course, the 360° views of the valley, the snow capped Mount Ruapehu, Mount Ngauruhoe, the craters, steam coming out of the earth... just spectacular! You really feel like on another planet. The descent to the lakes is probably the most dangerous... maybe not dangerous but the probability of injury is most likely to occur here if caution is not adhered to. Take your time and you’ll be fine. After another crater crossing, you arrive to a fourth, much larger lake, the Blue Lake. You see this one before the others from afar and is more impressive then than up close. In my opinion anyway. I forgot to mention that there are toilets available every 6 kilometres or so. Very handy. We stopped near one of these for lunch with a view. Not of the toilets. It’s where we got a spectacle of a helicopter bringing in materials and men to empty the toilets. Amazing the speed at which they conducted their work. From here on end it was pretty much all down hill. Dry, low lying brush to the Ketetahi Shelter where almost everyone stopped for a break and a chat. After that you enter the forest until you reach the second car park. Quite welcoming this forest for it’s shade. Oh and talk about shade (apart from the forest at the very end), there isn’t any, anywhere, on the alpine crossing. So come prepared with the necessary. Sunscreen, hat, windbreaker (lots of wind and the temperature drops as you arrive towards the summit, even in summer) and most important of all, water. Lots of it. Minimum a litre, more if you can. 19.4 kms up and over mountains is nothing to sniff at so be prepared, take your time and you’ll enjoy every moment of it. We got back to the lodge around 2 pm. Had a shower, relaxed a little and decided to hit the road. From here on end we were heading north back towards Auckland. 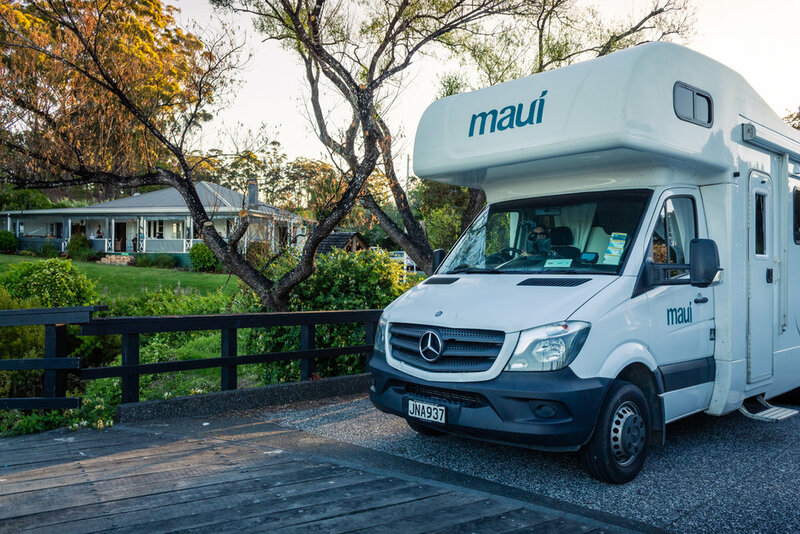 We stopped at Taumarunui Holiday Park in the town of Mananui for the night. We arrived a few hours before sunset and took the opportunity for a snooze, tidying up, relaxing, aperitif, dinner and bed. I think we were all in bed by 7:30-8 o’clock. The hike took it’s toll. That’s it my friends. Tomorrow we head to Waitomo Caves. Goodnight. p.s. just a self reminder to thank my friend, Alain, for the use of his photos and videos. We spend the majority of today, day 9, in Taupo visiting a couple of boutiques, falls and a extreme experience for one of us. We end the day thought, in Tongariro National Park. As we were taking photos at the end of day 8, I saw a lookout from the bridge just in front of the Aratiatia Dam and a sign indicating a trail that may lead to it. So this morning I though I’d checking that out. And I’m glad I did. It’s a beautiful, easy going walk that lead to two lookouts. Great views of Waikato River and the valley towards the Aratiatia Power Station, and beyond. Unfortunately the light was flat due the thin layer of clouds. The sun had a hard time piercing through. It did come out eventually but we were already on our way by then. Our fist visit for the morning was Lava Glass. A glassblowing gallery and cafe. I wish I had filmed the inside of the boutique to show you the stunning glassware on display. When you see all the beautiful, vivid colours and designs, and the owner of the place tells you there’s nothing painted, it’s all coloured glass... that’s very impressive, even amazing. For a small fee you have access to the workshop where they do all the glassblowing and to the glass garden where you can wander around hundreds of glass sculptures. It’s not a long visit so if you have a little time to spare, stop by the Lava Lass for a visit. You won’t regret it. 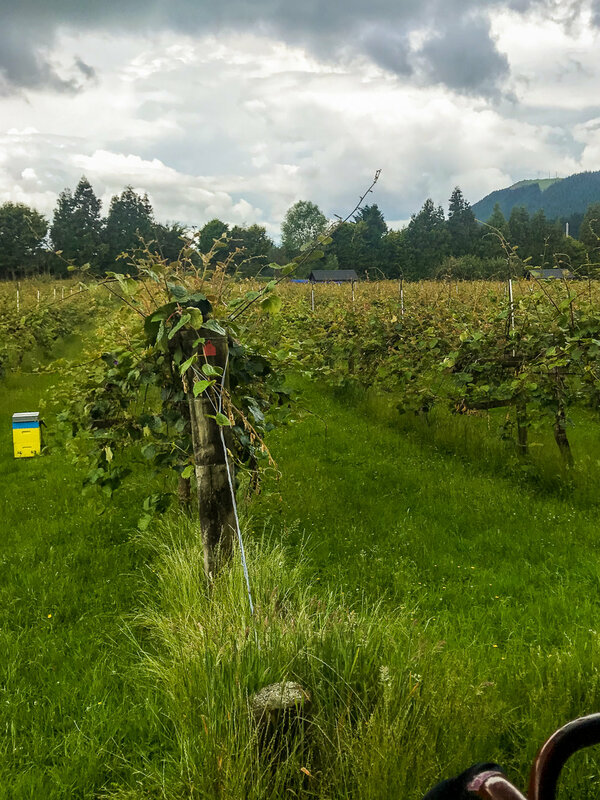 Our next stop was the Huka Honey Hive. I’ve never seen so many products with or made from honey. You’ll have to visit to check out their website for their line of products. I was equally surprised at the array of honey they had at the tasting stand. A must, is all I can’t say. An interesting place just to walk around. 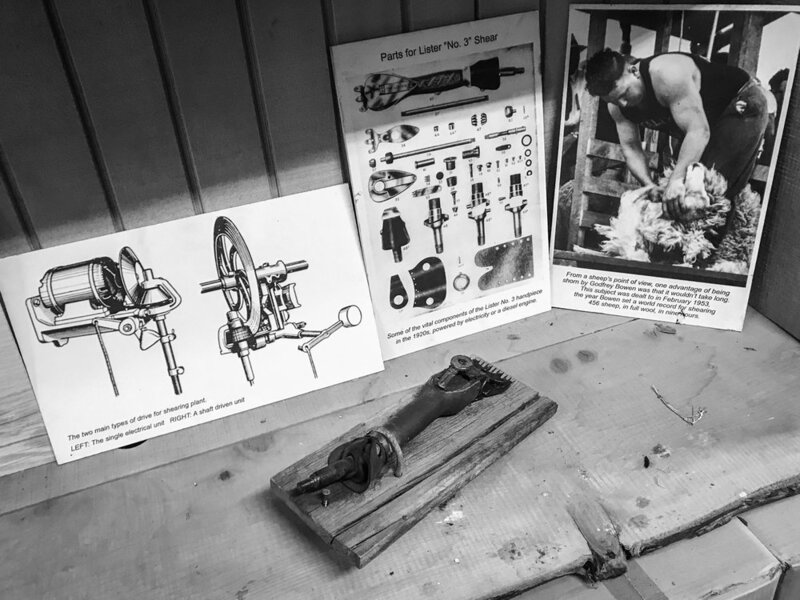 You’ll discover the materials used in the old days to extract honey and see the little bees at work. Fifteen minutes is all you need but I’m sure you’ll stay longer. I have to apologies for not having any photos of the Lava Glass Gallery nor of the Huka Honey Hive. I filmed those two place which you can check out the video here or the links above. Sorry. Huka Falls was our main objective today even though we were a little sidetracked. Now the falls are impressive in themselves but the surroundings are just gorgeous. 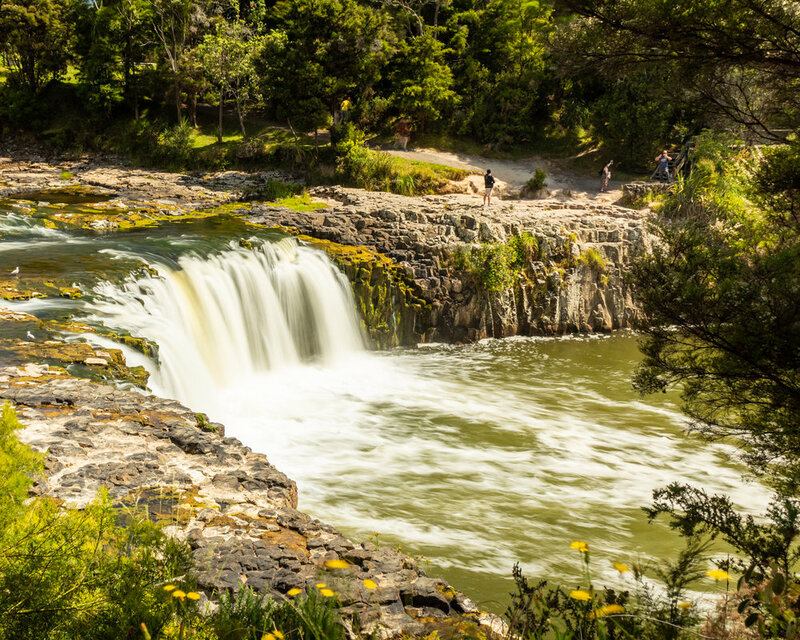 If you get the chance to visit, don’t just stop at the bridge nor the lookouts, wander upstream a little and duck down little tracks to see the peaceful shores of the Waikato River just before it turns into a torrent of water. Paloma, my friend’s daughter, wanted to have an extreme experience. 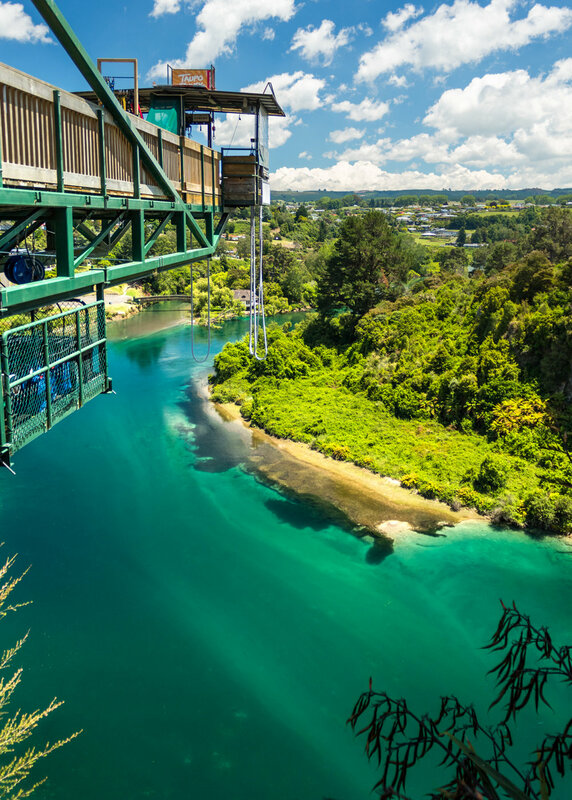 So Taupo Bungy was our next stop. She didn’t know which to choose from the Cliff Hanger or the Bungy. In the end she wasn’t too enthusiastic with her choice, the Cliff Hanger, even though we could hear her emotions as she swung (giggle). This part of the Waikato River is just as beautiful as upstream. The cliffs, the river, the vivid colours... just stunning. Even if extreme experiences isn’t your thing, just the beauty of the area is worth a quick stop. Once the adrenaline settled (giggle), we headed into town for lunch. Then the boys and girls split up for some last minute shopping. Alain and I looked around for hiking shoes as his weren’t adapted for the hike we’re going to do tomorrow. We had pretty much given up when we decided to browse the Hunting & Fishing New Zealand store and found a pair there. Nice, helpful and, most important, knowledgeable staff. He took their advice and didn’t regret it. Also had a great conversation with another staff member about a variety of things. A very nice experience in all. So now that we had the necessary equipment it was time to head farther south to Tongariro National Park. We stopped at a lookout just south of Taupo Lake that had a view north. A sunrise or sunset shot here would be nice. Kept going till we saw the gorgeous Mount Ruapehu. Just stunning! That’s when Alain told me about a chateau at the base of the mountain. Chateau Tongariro, we had to check it out. A beautiful, 200 year old building. A scene I had never seen before, mesmerising. We were going to stay just up the road then check out the chateau but the campsite was full. We ended up finding a spot at the Discovery Lodge Tongariro. Actually, there wasn’t a spot for our camper-van but the they were very accommodating. And very helpful with details about the hike we were going on tomorrow. And talking about tomorrow, early morning means an early night. So that’s it for day 9 my friends. Hope to see for the next video where we seem to hike Mars. Goodnight. p.s. I always have to thank Alain for the use of some of his material. Without it, some of these videos wouldn’t make sense. We ended day 8 in Taupo and stay in Taupo today but end the day in the Tongariro National Park. An early morning start, as I wanted to checkout a track I saw last evening. It lead me to a couple of lookouts that I could see from the Aratiatia Dam bridge, which is what I was hoping for. And what gorgeous views, from beyond the dam, down the valley past the Aratiatia Power Station. Magnificent! Pity I didn’t get nice light for my photos. Our first unplanned visit of the day was at the Lava Glass gallery and cafe. For a small fee you can visit the workshop and watch the glassblowers do their magic and visit their private glass garden. Well worth the fee. Just stopping by for a coffee and browsing the gallery is worthwhile. A second unplanned stop was the Huka Honey Hive. If for nothing else but the honey tasting, this place is worth checking out. There is so much more though. From well-being and beauty products to lollies and ice-cream. And much more. You’ll end up leaving with something, for sure. Our first planned visit, Huka Falls. Impressive! Not just visually but the noise and velocity of the volume of water travelling beneath you... you can feel it’s power vibrating through your body. Quite an experience. But don’t stop at the bridge and the lookouts. Wander upstream a little and the atmosphere is quite the opposite. Calm, tranquil, peaceful. Beautiful. Worth the stroll. Next stop was Taupo Bungy, for Paloma wanted an extreme experience. She went with the Cliff Hanger instead of the Bungy but later regretted her choice just a little. The Cliff Hanger wasn’t as extreme as she had thought, even though her cries say otherwise haha she did enjoy it. After all that adrenaline, it was time for lunch and last minute shopping in town. Then it was direction Tongariro National Park, where we were staying the night. Oh what a scenic drive. Stunning views of Mount Ruapehu and just magnificent as the backdrop to the Chateau Tongariro. We stayed the night at the Discovery Lodge Tongariro. We’re staying in the area because tomorrow we’ve planned an all day hike. So I hope to see you for day 10 where we walk 19.4 kms. Just to be precise. Goodnight. p.s. once again a big thanks to Alain for his contribution to these videos. 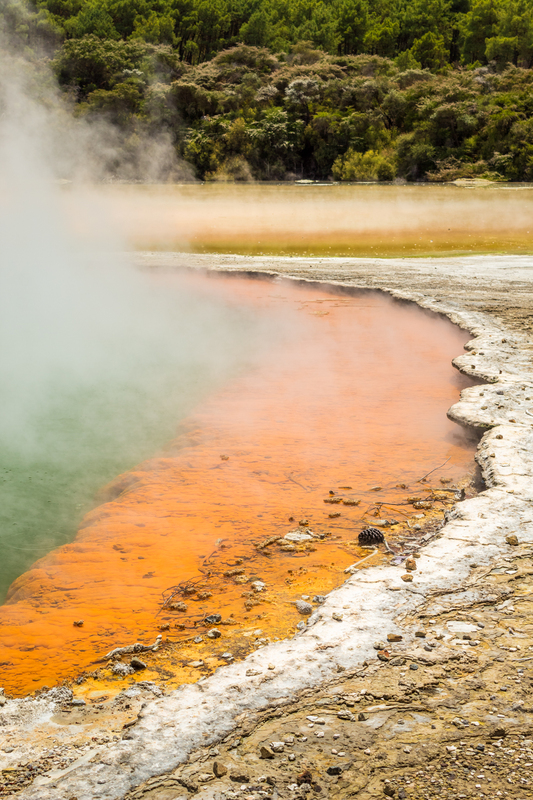 As you know from the video, day 8 brings us to Wai-O-Tapu Thermal Wonderland then onto Taupo. As I mentioned on my video post, if you’re traveling between Rotorua and Taupo, the Wai-O-Tapu Thermal Wonderland is a must visit. And do take the time to check out Lady Knox Geyser, while you’re there. It doesn’t take long and you’ll also learn about how it was discovered. The thermal wonderland truely is a wonderland. And might I add, out of this world. You really have the impression of walking on another planet as you make your way through the park. The steaming holes in the ground, the mud pools and the stunning, vivid colours of the lakes make it equally hard to believe your eyes. We didn’t do much in Taupo. It was towards the end of the day and shops were starting to close up. We took a short stroll along the shore, a quick visit in the town centre and did some grocery shopping. We ended up staying at the free parking near the Aratiatia Dam. It’s also where the Huka Falls Cruise departs from on the Waikato River. We were only three camper vans staying the night in this peaceful area. That’s it for the photos of day 8. Please join me for the next post where we see lava glass, bees, falls, a chateau and cliffhang. Goodnight. p.s. again, Alain’s contribution was a big help in telling the story. We ended day 7 with rain and start day 8 under blue skies. 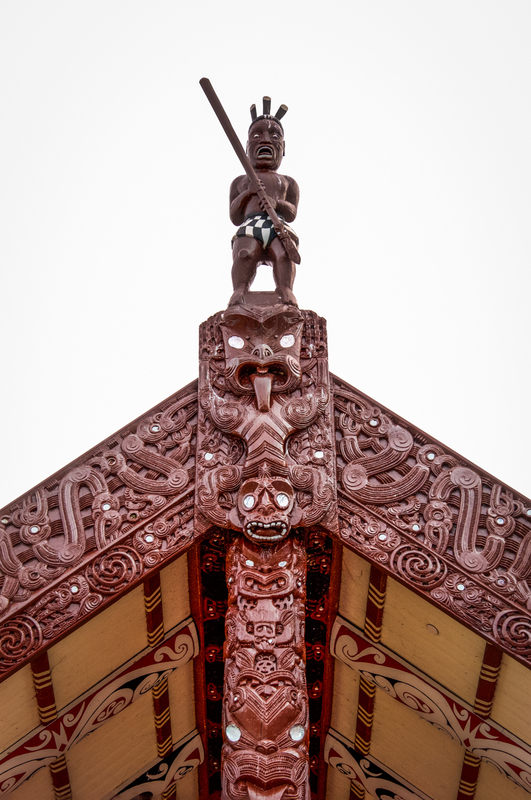 Today we leave Rotorua for Taupo but first we visit a Lady and New Zealand’s wonderland. We arrived in Wai-O-Tapu just in time to see the Lady Knox Geyser erupt. It’s quite remarkable they can induce the eruption simply with soap. We got about a ten metre eruption. Impressive! The whole show last only about half an hour from the time you arrive to when you leave. It’s a must see so if you’re ever in the area, don’t even think twice about it. 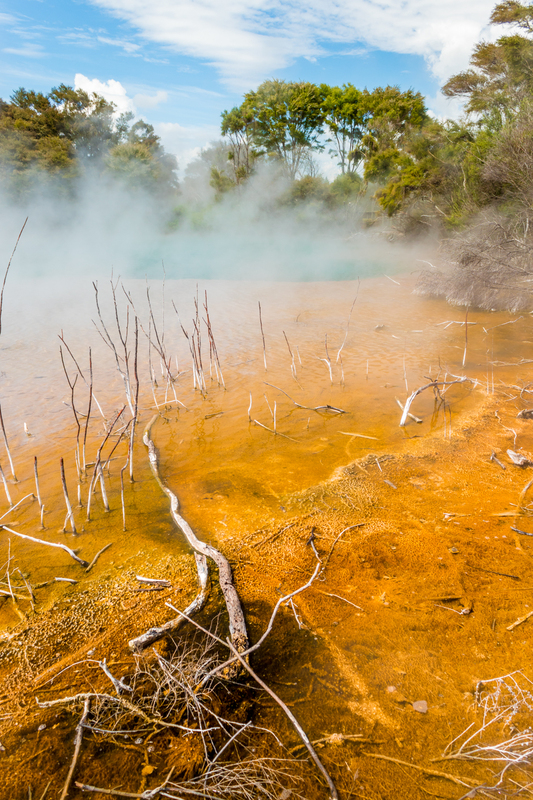 And that’s even more so for the Wai-O-Tapu Thermal Wonderland. Give yourself plenty of time as this can take easily a couple of hours. More if you’re into photography. Not only will the colours astound you but the beauty of the area as well. OK, you’ll have to deal with the smell of sulphur but you quickly get used to it. The mud pools are just as interesting and make you want to jump in. Not a good idea though. And there are plenty of signs to remind you too. Anyway, if you’re traveling between Rotorua and Taupo, Wai-O-Tapu Thermal Wonderland is on the way and a must visit. I highly recommend it. Manu prepared a delicious dinner, mussels in white wine with wedges. We went with wedges for a change from the usual fries we would have back home. I tried to record it but quickly realised I wasn’t doing it justice. Sorry. I mean if that was a restaurant advertisement, I wouldn’t go there. But I can say that it was deliciously. Thank you Manu. Time to go to bed my friends as day 8 comes to an end. Join me for the next video where we see how lava glass is made, cliffhang, visit bees, falls and drive by a chateau. Goodnight. p.s. must not forget to thank Alain for his contribution to these videos. Wish I had more time to visit Rotorua. There’s so much to see here. Click here if you haven’t seen the video of day 7. There are a few things on it that I haven’t taken photos of. My morning started early with a stroll where I found myself on a sulphur plateau near the Puaranga Stream. It was overcast when I arrived but then golden hour just exploded through some clouds just long enough for me to setup and capture it. Not the best of compositions but better than nothing in my eyes. It covered up again for the next few hours. I saw a path heading into some bushes along the sulphur plateau and thought I’d follow it in hopes of capturing more photos. Not a lot to photograph but a very nice path nonetheless. So once we all had breakfast, we headed to Kuirau Park & Mud Pools. I was surprised to find different hot water springs in such a small area. Black water, aqua water, green with white bubbles not to mention the light and dark brown mud bubbles. Very interesting. There was an area where you could dip your feet into the hot springs as well, which the girls took to right away. After the park we took the Skyline to the Volcanic Hills Wine Tasting Room. The Skyline is a must just for the amazing views. Before the alcohol though, we visited the Jelly Belly Store where we tasted some very bizarre flavoured lollies. Then Alain luge raced before we all had lunch. I don’t have any photos of the wine tasting but check out the video or the link just above to see what the place looks like. The wines were very good and the whole experience was great. Our last visit of the day was the Ohinemutu Maori Village. Here you’l find amazing carvings decorating the buildings. A very peaceful area on the shores of Lake Rotorua. My photos don’t do justice to these beautiful buildings. Our stop for the night was the Cosy Cottage Thermal Holiday Park. We were supposed to do the Redwoods Treewalk that evening but it started to rain pretty heavy and didn’t stop till late in the night. Very unfortunate because it looks like an amazing thing to do. Day 7 is over. Tomorrow we visit a wonderland before heading to Taupo. Hope to see you then. Goodnight. p.s. thanks to Alain and his wife, Manu, for the use of some of their photos and videos. Day 7 presents us with a full day of visits. Day 6 was easy going, which helped us recover from a lot of driving and walking of the pass couple of days. An early start for me this morning, as I was hoping to capture sunrise. It was very cloudy but I got a break in the clouds just long enough to capture golden hour. The composition wasn’t great but glad I got something. It was overcast for the next few hours. I found myself on a sulphur plateau on Lake Rotorua near Puaranga Stream. There were thousands of seagulls, very protective of their environment. I had a few flying very close around me, screaming or what those birds do. It reminded me of a Hitchcock movie. There’s a path that leads into the bushes among the sulphur. It’s a nice walk and I got a couple of photos. Our first visit of the day was Kuirau Park & Mud Pools. A beautiful area with ponds, hot waters, mud pools and flowers. There’s an area where you can dip your feet in hot water, which the girls took advantage of. Next, we took the Skyline to the Volcanic Hills Wine Tasting Room. Before the tasting we visited the Jelly Belly store, bought some lollies and ate some very bizarre tasting Jelly Bellies. Then Alain and I did a luge race before we stopped for lunch. Alain went back to do more luge afterwards while his wife, Manu, and I went wine tasting. A wonderful room with amazing views. And so is the wine. I didn’t know New Zealand had so many wineries and good wines. Our hostess was lovely, taking the time to chat with us yet giving us time to savour the wine. Very nice experience. At the end of the afternoon, we visited the Ohinemutu Maori Village. Beautiful buildings with amazing carvings for decorations. We were the only ones there and it didn’t take long to visit. Worth the stop. The Cosy Cottage Thermal Holiday Park is where we stayed for the night. We needed to secure a spot for the night as we intended to visit the Redwoods Tree Walk. Unfortunately, the weather turned grey and it rained heavy pretty much all night. That’s it for day 7 my friends. Thank you for watching and, please, come back for the next video where we visit a wonderland and head to Taupo. Goodnight. p.s. a big thanks to Alain and Manu for the use of some of their photos and videos. Photos from the Day 06 video are here with a few extras thrown in. For the boys, our first morning in Rotorua started with a visit to the Agrodome. The girls spent the day shopping. We spent pretty much all morning here. We did the Farm Show and the Farm Tour. Both excellent and worth doing. They do have two other tours but we didn’t do those. 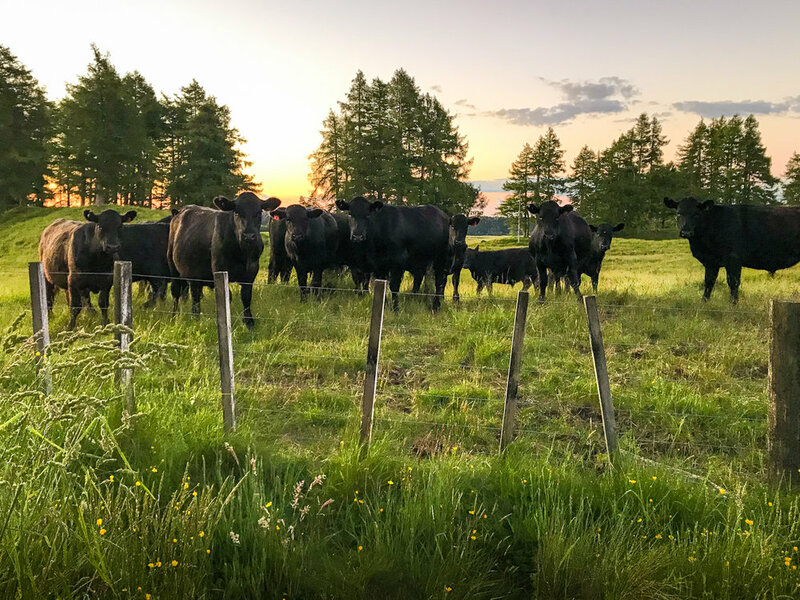 Agrodome is well worth a visit for young and old but kids will especially love it for the hands-on experience with the animals. There aren’t a lot of photos from the afternoon as we joined the girls for a stroll and shopping. Nearing evening we made our way towards Lake Rotorua and and got to see swans and cygnets near the shore. On the way down here we discovered Eat Street. We came back here for dinner at Mac’s Steakhouse. Very nice food and the staff were excellent. We had a good laugh with them. We stayed at a free camper-van parking area that night, just opposite the Polynesian Spa. Well that’s it for this quick post. I hope to see you for the next video, which should be out in the next two, three days. p.s. a big thanks to Alain for the use of some of his videos and photos. Welcome back for day 6 of our little trip around the North Island of New Zealand. Today we leave The Coromandel for Rotorua. This video is the first of the two and half days we stayed here. Arriving in Rotorua, Alain and I dropped the girls at a shopping mall before heading to the Agrodome. They have four experiences you can choose from or you can do all of them if you have the time. Alain and I did two, the Farm Show and the Farm Tour. Before the show started, we were treated to a sheep gathering performance outside. The show itself is entertaining, has a bit of humour, is educational and has hands-on experiences. It is very interesting. I didn’t know there were 17 different types of sheep in the world. 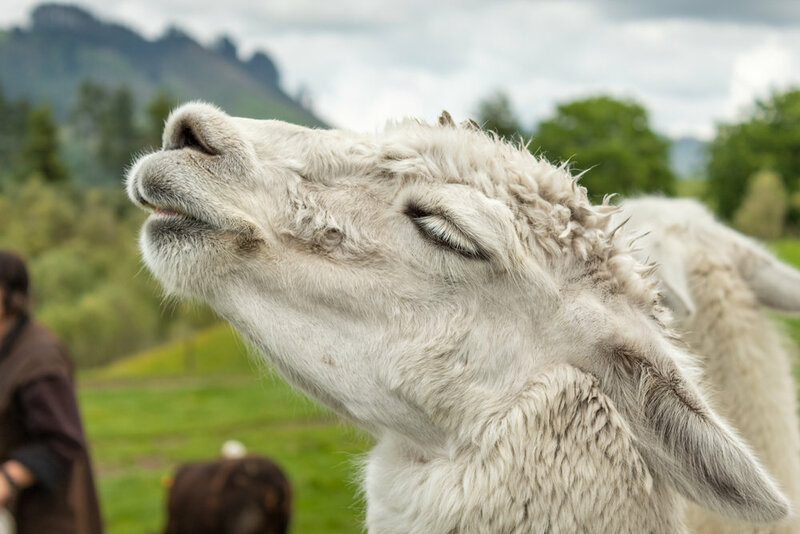 The tour is also great because you, not only, visit the farm but you also get to mingle with some animals and feed them. Oh and you get a little tasting of their homegrown kiwifruit juice. Delicious. After the Agrodome we joined the girls for some shopping and just walk around a little. 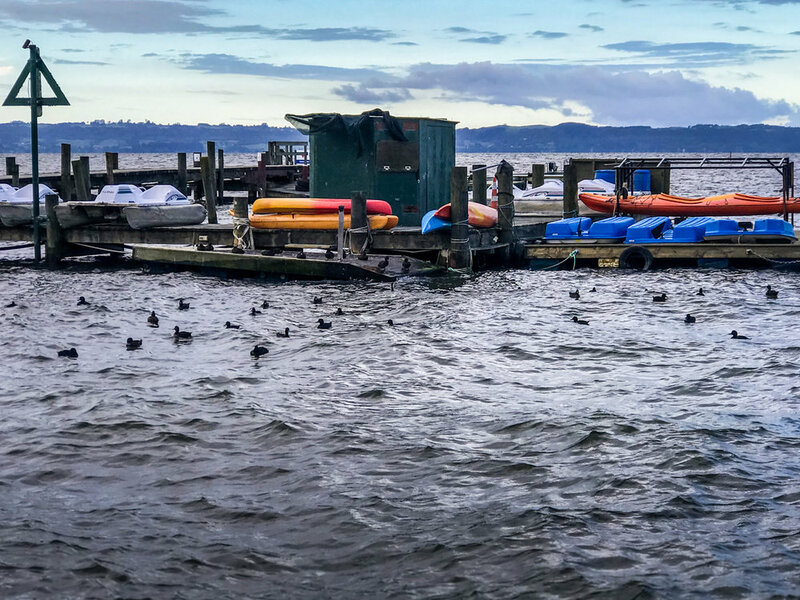 We ended up wandering down to Rotorua Lake where we saw swans and their cygnets. A beautiful area. Coming down here, we walked through Eat Street where we had a delicious dinner at Mac’s Steakhouse. And I have to give a shoutout to the waiters and waitresses who were just fantastic. Tonight we stay at a free camper-van parking area near the the Polynesian Spa. Though there were a number of camper-vans, it was very quiet. So I bade you goodnight my friends and invite you to the next video, where we dip our feet in hot water, race, wine taste and visit a small Maori village. Goodnight. p.s. yes, I’m sure you know by now but I without his photos and videos my story wouldn’t be coherent. Thanks Alain. I’ve added a few more photos here, to the one’s included in my last video. I had a lot more but it would’ve been too many to upload. Sorry. 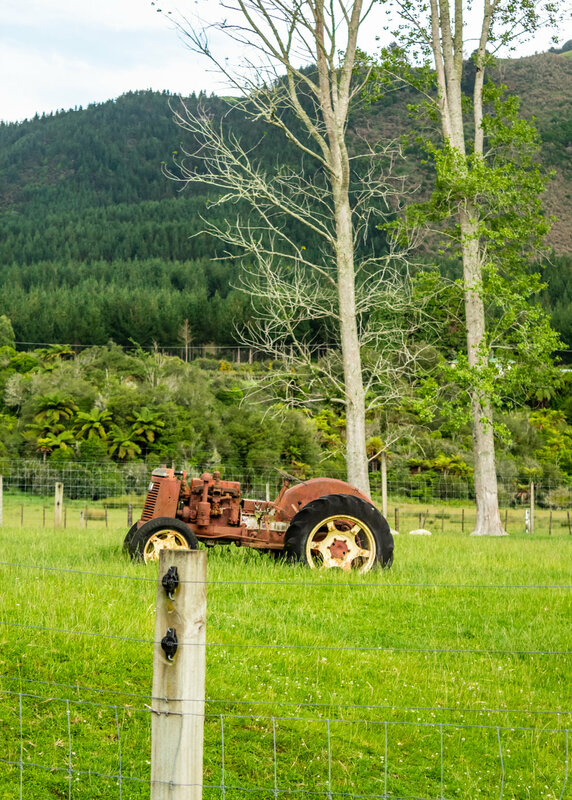 In case you haven’t seen the last video or it’s your first time here, these photos are from the fifth day of a small trip around the North Island of New Zealand. 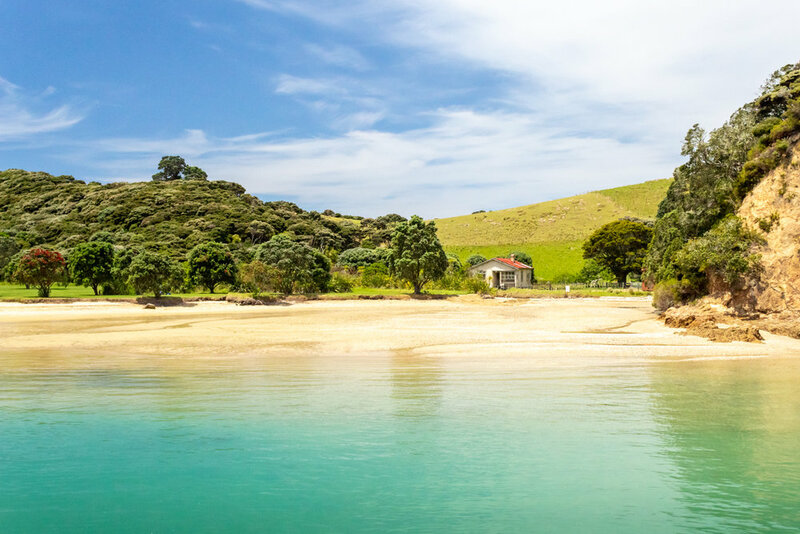 Today we wake up in Cooks Bay and visit Cathedral Cove in Hahei, the hot springs in Hot Water Beach and finish the day with stroll through Karangahake Gorge. The pics start in Cooks Beach on an overcast morning. My attention was taken by a wild mushroom, which was OK because I was having difficulties finding compositions for a photo. After breakfast we made our way to Hahei Beach where the forty-five minute walk to Cathedral Cove starts. I think it took me well over an hour to get there with all the photo stops I made. A beautiful walk with great water views. By the time I got back, it was past lunch time so we headed straight for Hot Water Beach for lunch at Hotties and to check out the hot springs on the beach. 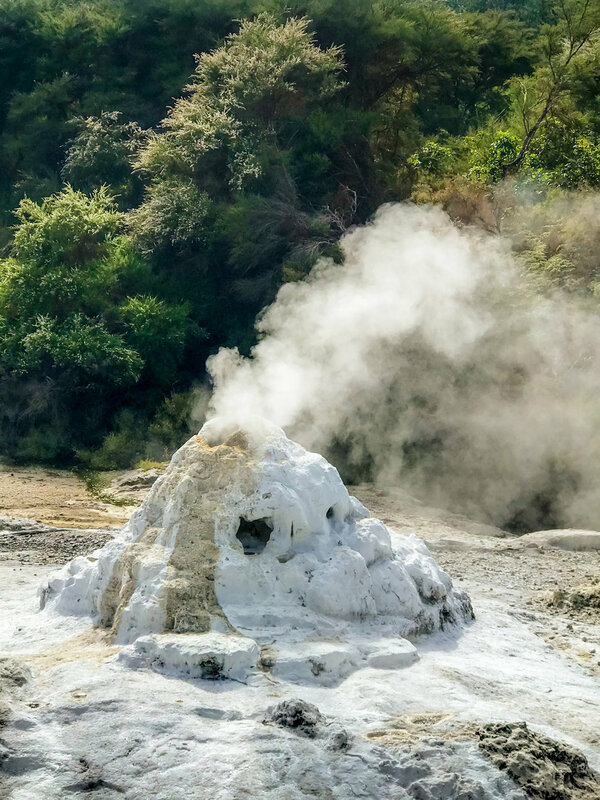 Though quite an amazing phenomenon, the hot springs area is quite small. We didn’t get to dip our toes in but that’s because we didn’t want to hustle for a spot. I found the boulders on the south end of the beach very interesting thus spent most of my time there. Karangahake Gorge was our last visit for the day. An amazing place, well worth the visit. A wonderful walk along old rail tracks and tunnels with gorgeous views down valleys and rivers. Multiple tracks available depending on the time you have. That night we stayed at the Paeroa RV Center, not too far from the gorge, in the town of Paeroa. As mentioned in the last video post, our next stop is Rotorua where we spend two nights. See you then. Goodnight. p.s. can’t forget to thank Alain for letting me use some of his photos and video clips. I want to apologies for the time it took to get this video out. I’ve been having difficulties colour correcting the videos and am still not happy with the outcome. I thought I’d better stop fussing about and just get it out. So here we are, day 5 of our little trip around the Northern Island of New Zealand. 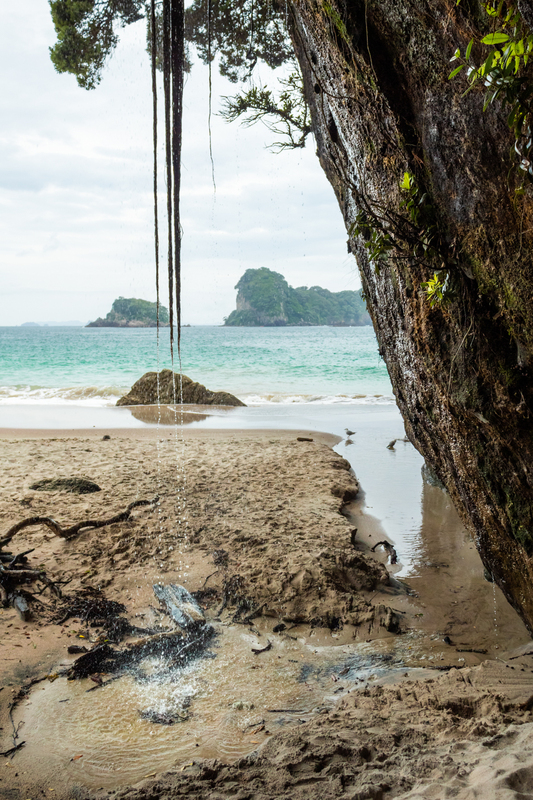 Again, picking up from the last video , today we do a small hike to Cathedral Cove, visit the Hot Water Beach and explore the Karangahake Gorge. As with every morning, I got up early to explore the surroundings. Cooks Beach in this case. It was an overcast morning but warm nonetheless. It was sooo quiet and calm as I walked along the river to the beach. Even there it was surprisingly tranquil. Not a soul to be seen. Though it was a beautiful area, I had great difficulty finding a composition. So I snapped a couple of photos just to document the area. I did find a wild mushroom, which took all of my attention. I must have taken half a dozen shots of it. Trying out macro photography. I quite like the photos. After breakfast we headed to Hahei Beach where the track to Cathedral Cove starts. An easy walk that anyone can do. A couple of small, steep hills but take your time and you’ll be just fine. The breathtaking views make it worth the effort. The first thing you see as you arrive at Cathedral Cove is the Smiling Sphinx Rock, seemingly floating in the water not far from the beach. Then you notice the hole in the cliff and wonder how it’s possible. At low tide you can make your way through it,to the other side, where the Te Hoho Rock sits, just like the Sphinx, in the middle of the water. The late morning and the amount of tourists, including us, didn’t make for beautiful photos. Quite happy with what I took but I’ll have to come back here to get the shots I was looking for. By the time I got back to the campervan, where my friends were waiting in hunger, it was already past lunch time. We took off for Hot Water Beach for lunch and the hot springs, of course. Lunch was delicious and so was the local beer at Hotties. The hot springs though, we never got to try. Though the beach is, I don’t know, a kilometre long, the hot springs’ area is tiny. There were sooo many people there in a frenzy digging up holes everywhere that the wonder of it all had quickly disappeared. Don’t get me wrong, it’s a must do but maybe in a period of the year where there may be less people. What did amaze me though, were the large boulders on the southern end of the beach. That was beautiful. Once over our disappointment of the hot springs, we made our way to the Karangahake Gorge. There are a handful of tracks ranging from an hour walk to eight hours. I can’t remember if we did the Rail Tunnel Loop or the Windows Walk Loop but, either way, it was absolutely amazing. A wonderful walk through tunnels with beautiful views down the valley and the Waitawheta River. It’s a pity we didn’t have more time, I would’ve loved to do the four hour track. It was late afternoon and we needed to find a spot for the night. We chose the Paeroa RV Center because it was close and had powered sites and most importantly, a laundrette. That’s it for day 5. I hope you enjoyed it. I know it’s not easy with the jumpy footage. I hope to see you on the next video where I receive my Masters in Milking, dip our feet in hot water, race downhill and visit a Maori village. Goodnight. p.s. special thanks to Alain for the use of some of his photos and videos. Here are the photos from the last video. I’ve added a few extras that weren’t used in the video. 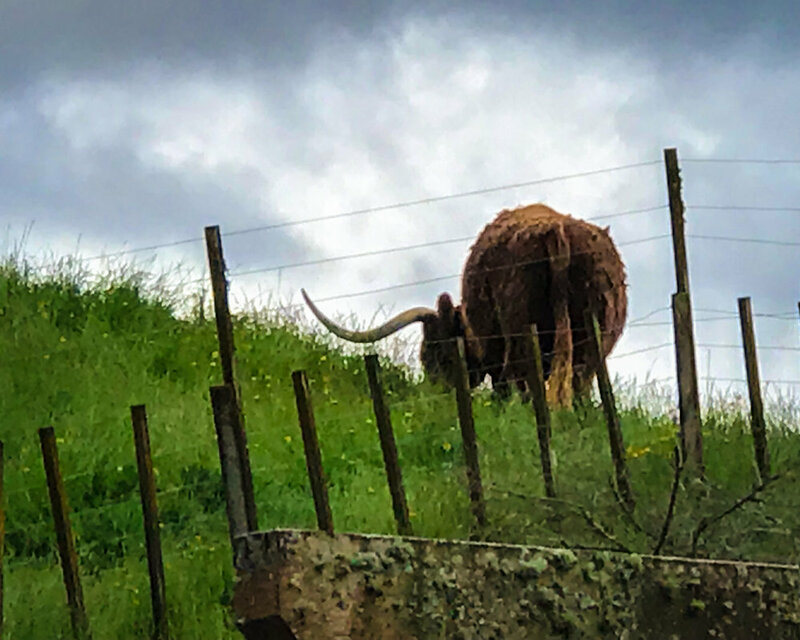 To recap the video and these photos, we stayed overnight at the Sheepworld Caravan & Camping Park in Warkworth (New Zealand) then traveled across The Coromandel via The 309 Road to Cooks Bay. Though we didn’t stay very long at the Sheepworld Caravan & Camping Park, after walking around the place, I became very fond of it. The rustic country look. The Crash Start in the middle of the backyard. The volleyball net with stuff growing off it. The red sheep. Cow50 who posed for a photo but then wanted to eat my tripod. And beautiful, little, white flowers. Oh and the view of the mountains from the carpark was amazing too. Our first stop of the day was Auckland to sort out some problems we had with the camper-van. We didn’t record any of that part of the trip. I regret it a little but can’t do anything about it now. From Auckland we headed south-east to The Coromandel towards Preece Point. From there onto The 309 Road where we stumbled upon Stuart & The Pigs (without Stuart) and stopped at Waiau Waterfall. I really like this waterfall because the area is small, it’s completely surrounded by forest and there’s a small waterhole. Lovely little spot. Our day ended in Cooks Bay where we parked our camper-van on a free site just behind the Purangi Regional Reserve, along the Oyster River (I think that’s the river’s name but am not sure). Only took a couple of late afternoon shots then we just sat back and relaxed. It was the end of a long day of driving. Next post is a video where we visit a cathedral and a gorge. Hope to see you then. Ciao. p.s. can not forget to thank Alain for his contribution to this set of photos as well. This video is short but fast paced. We drove quite a bit that day so I took a few time-lapses. I hope you don’t get too queazy. Day 4 of our trip around the North Island of New Zealand, took us from Warkworth to Cooks Beach on the east side of The Coromandel. With, of course, a quick stop back at the camper-van hire place in Auckland. We were having two or three problems with our camper-van. On the last video, we ended the day at the Sheepworld Caravan & Camping Park in Warkworth. I didn’t get the chance to wander around the place the night before so I thought I’d do that this morning. Apart from the common lounge you would have seen on the last video, there was also a large dining and kitchen area as well. Outdoors and country style looking. Rustic and beautiful. I found the Crash Start stranded out the back. Unusual place to have a boat. I saw red sheep. Yes, red sheep. And I don’t mean a red spot on their bottoms but the whole sheep painted red. And I almost had my tripod eaten by Cow50. The weird and wonderful Sheepworld. Anyway, it was time to head to Auckland to solve our camper-van problems. From the three problems we had, one was legitimate (heater problem), one was our misunderstanding (can’t use power socket without being plugged to a powered-site) and one was our misuse (not plugging the powered-site cable properly). Well, didn’t we feel stupid for a moment there. Onwards with the trip. We made our way to Preece Point and I must say, the scenic road of the east coast of The Coromandel is just magnificent. It’s so beautiful that we all forgot to record it. Darn it! From Preece Point we turn onto the very winding The 309 Road to cross over the mountains to Cooks Beach. Many view points along this road. We stopped at one that was at the entrance to the Ohana Farms. A while later, we stumbled upon Stuart & the Pigs. Well, just the pigs. They were crossing the road to head over to their… car yard?! Then we stopped at a place we all wanted to visit, the Waiau Waterfalls. Small falls but with the waterhole at it’s base and the surrounding forest, it really is worth a visit. We didn’t stop again until we reach Cooks Beach where we stayed the night. 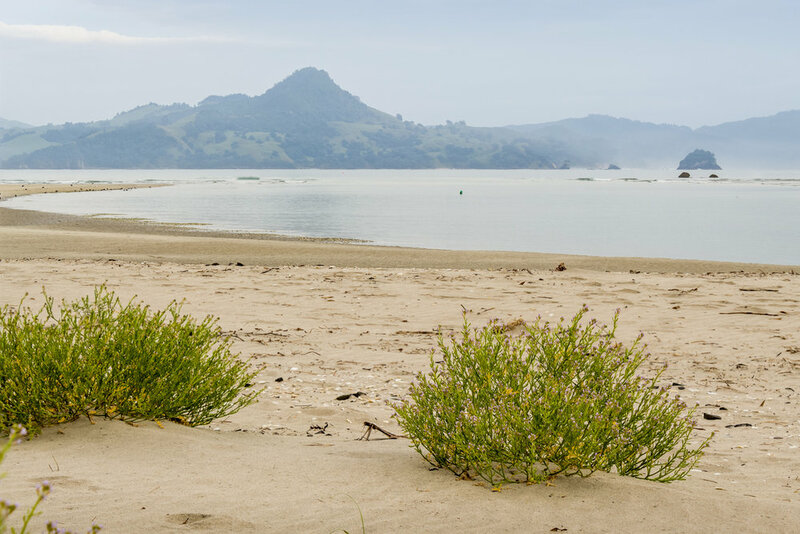 A free campsite on the south end of the beach behind the Purangi Regional Reserve. I think it’s along the outlet of the Oyster River but don’t quote me on that. That’s it for day 4 my friends. I hope you come back for day 5 where we visit a cathedral and a gorge. Goodnight. p.s. Once again, a huge thank you to Alain for his clips and photos. Here are the photos from the last video. I think I added a couple more in there too. 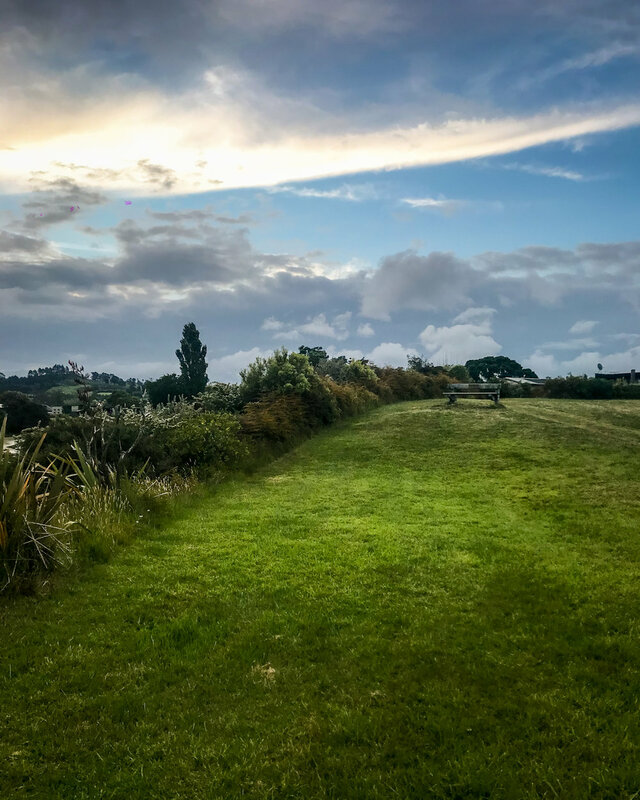 So to recap the third day of our New Zealand trip of the North Island, we woke up in Kaikohe, a town west of Kerikeri and made our way to Haruru Falls in Waitangi. 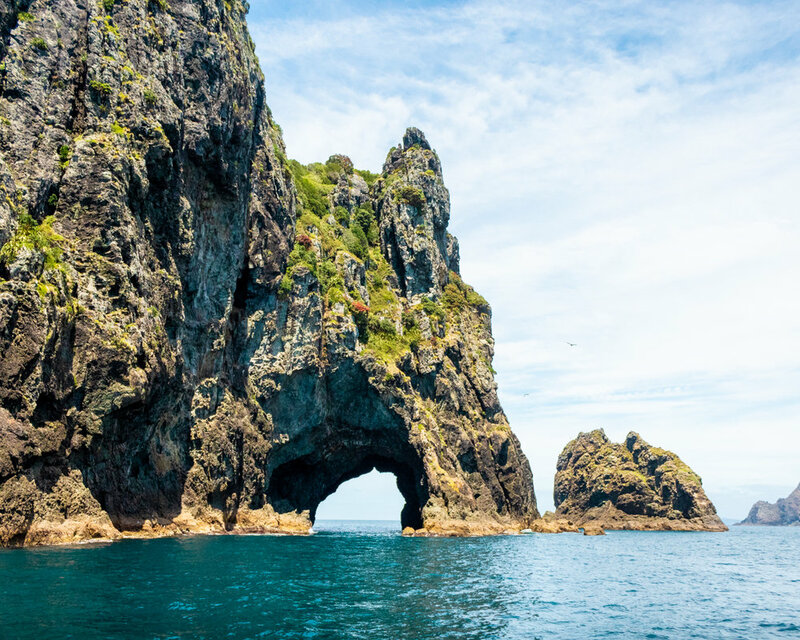 From there we headed to Paihia where we had booked a ferry to visit the famous Hole In The Rock on Motukokako Island. On the way there and back, we stopped over at Otehei Bay on Urupukapuka Island. The Hole In The Rock is just after Cape Brett, where you will notice a hut and lighthouse on the hill. Back in Paihia I took a photo of the beautiful stone building, the St. Paul’s Anglican church. 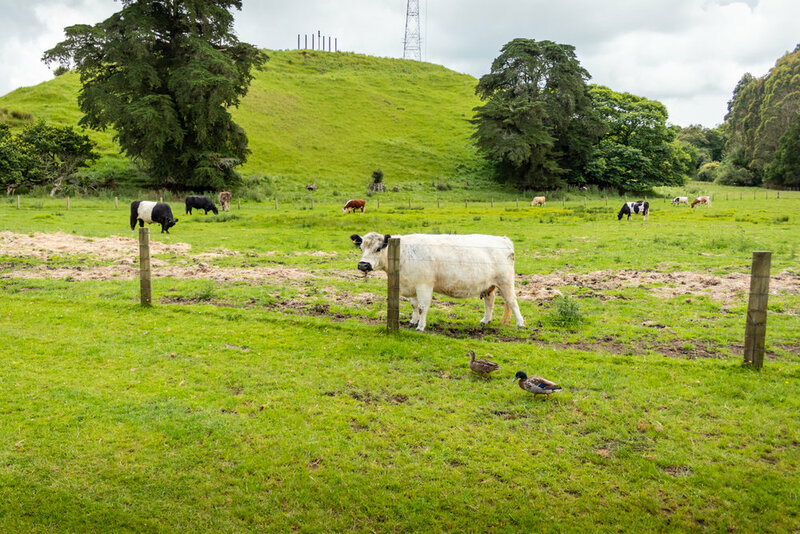 We hit the road back towards Auckland that afternoon and stopped for the night at the Sheep World Caravan & Camping Park. A wonderful place and so is the owner. Again, I’d like to thank Alain, my friend, for letting me use a couple of his photos. Good morning and welcome back for this third video in a long series. I must warn though the quality of this video is… not great. Not as bad as day 1 but not as good as day 2 either. I tried to do slow-motion videos but I just couldn’t stop the focus from jumping around. So you may feel a little queasy sometimes. You’ve been warned. Picking up from where we left off on the last video, where we decided to camp on a free site which led us to a town called Kaikohe. A town about 45 minutes west of Kerikeri. Today, we were heading to Paihia but I wanted to visit Kaikohe before doing so. I got up early and headed for Broadway, the main road. I bought a cup of coffee to accompany me on my little visit. A charming town and lot bigger than I thought. I saw these beautiful murals in a small alley. There are only a couple in the video but there were a lot more. I had a very nice conversation with a couple of retirees. A Maori woman and a Kiwi man, friends enjoying each other’s company, watching people walking by. 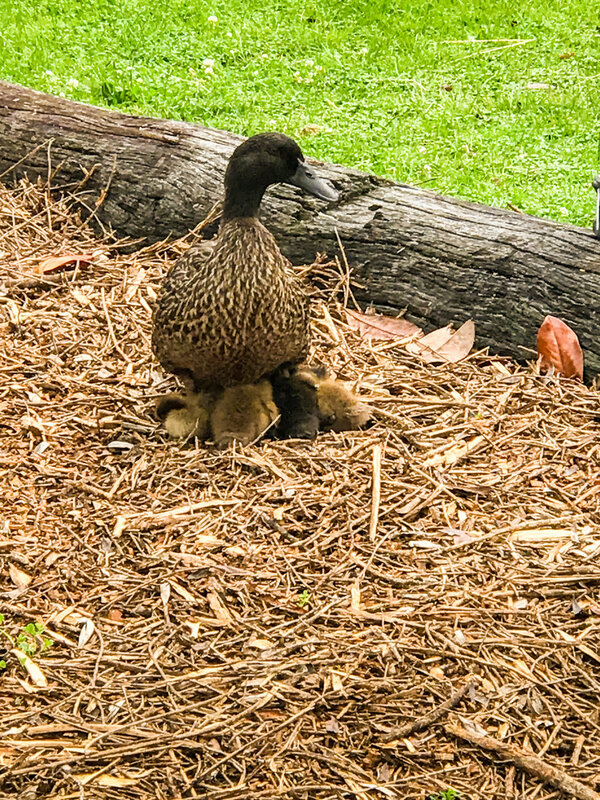 They were sitting on a bench and said hello as I walked by. I said hello back and before we knew it, 15 minutes had gone by. Wonderful people and great conversation. Once brekky was over, it was time to hit the road. We had one stop before Paihia and that was Haruru Falls. Not the largest of falls but worth a visit as the surroundings are beautiful and calm. You can kayak your way up to the falls and have a picnic, if you wish. A lovely little spot and worth a stop over. 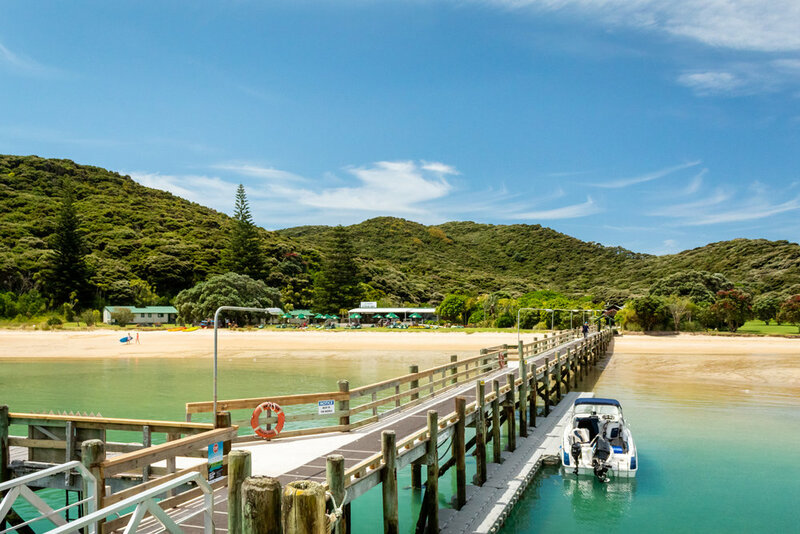 We had booked a small cruise/ferry to Motukokako Island from Paihia. We were going to see the famous Hole In The Rock and with a little chance go through it. The return trip takes about 3 hours so we had lunch before the 12:30 departure. 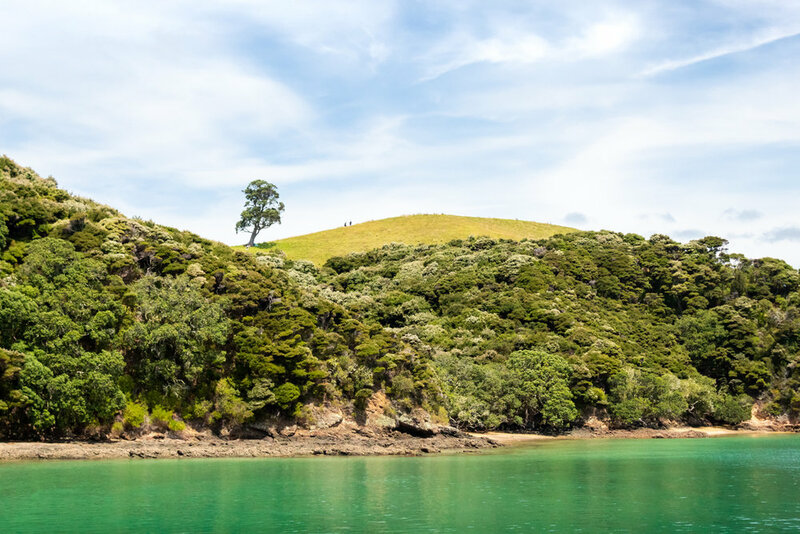 On the way up to and back from Motukokako Island, the boat stopped off at Otehei Bay on Urupukapuka Island. A gorgeous little bay with a restaurant. Plenty to do on this little island. 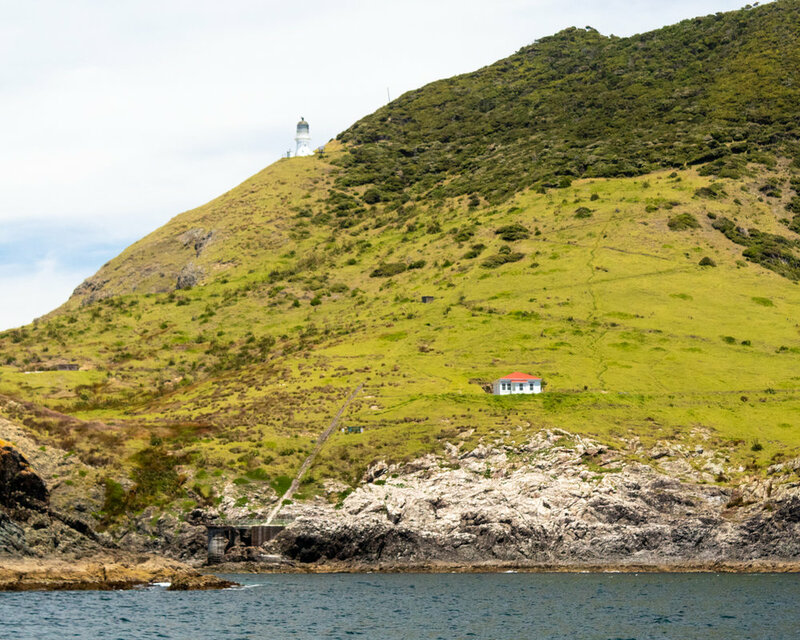 As you arrive at The Hole In The Rock, on your left side you can see Cape Brett’s hut and lighthouse. 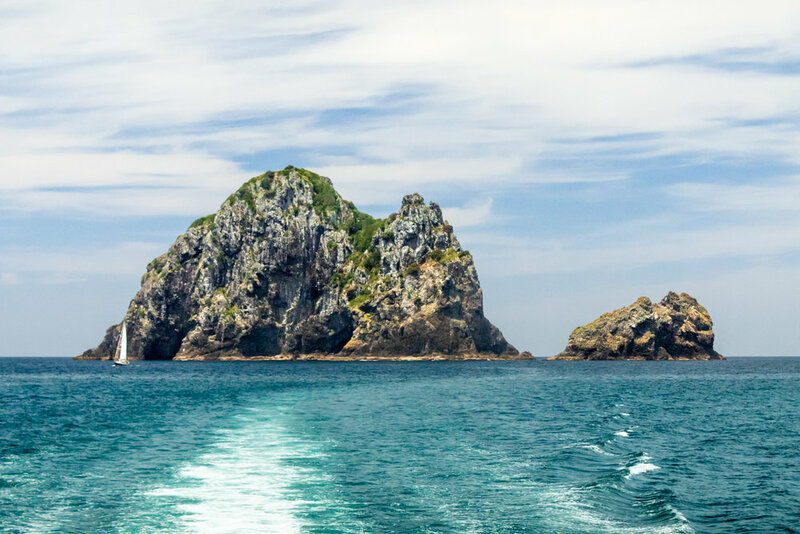 Then you notice the huge rock formation, Motukokako Island. It’s a tight squeeze but once up close and personal to The Hole In The Rock, the skipper will direct the boat through it. Unfortunate, the waters were choppy that day and thus weren’t able to experience that. Unlucky us. The return to Paihia is the same trip in reverse. 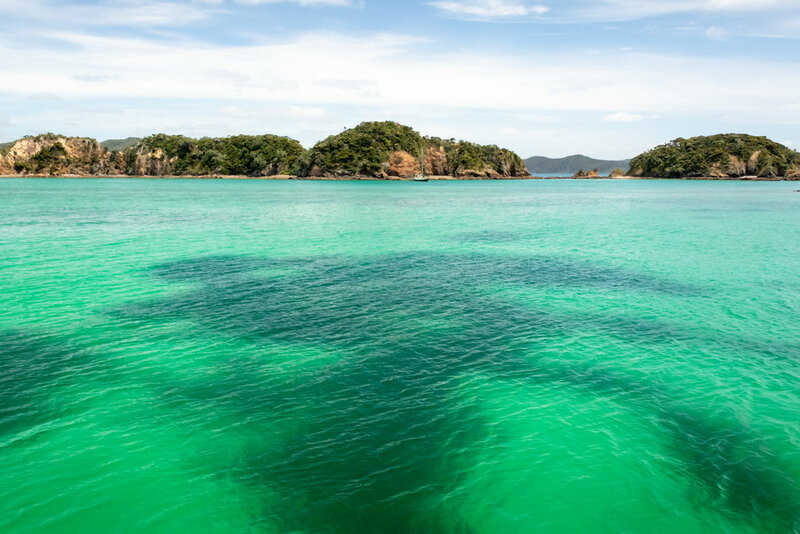 So we headed back to Otehei Bay and just before arriving in Paihia, we noticed four dolphins afar. Not sure if they were playing or fishing. Lucky us. Back on land we headed straight for St. Paul’s Anglican Church, just across the road from the beach. I’m not a believer but the stone building is just amazing. I had to photograph it. Anyway, it was late afternoon and we had about three hours before sunset. We were having problems with our camper-van thus decided to make our way back towards Auckland and stop somewhere halfway down. We were heading to The Coromandel the next day anyway so the extra couple hours would be used to stop at the Camper-van Hire to get some help. We pulled up for the night at the Sheep World Caravan & Camping Park. A wonderful, funny and straight-talking old man was there to welcome us. Very helpful too. I didn’t film anything once there because of the problems with the camper-van and we were just tired from the long day. I got the last photo from my friend Alain. The quaint, little common-lounge. You could even exchange books. What a wonderful idea. Well that’s it for now and thank you for watching. 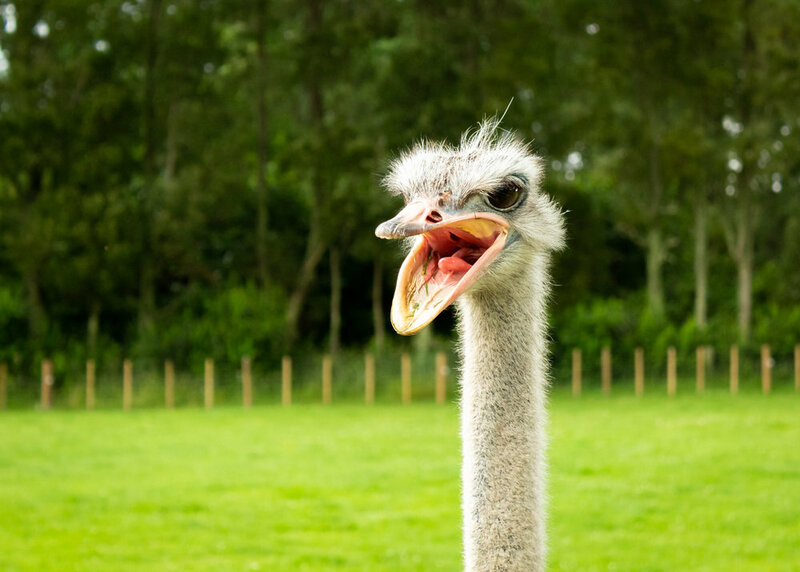 The next video has animals and… what problems? Goodnight. Oh before I go, I want to thank my friend Alain for letting me use a couple of his photos in this video. Thanks mate. I thought I’d share the photos that were in the video of my last post. I’ve wanted to share them for a while but wanted to get the video out first. You might have noticed that the first two photos are not from Kerikeri but Auckland (New Zealand). This was on our first full day in New Zealand, I got up early, before my friends, to check out the Piers at the end of Queen Street, where we’d eaten at the night before. Later that morning we were picking up our camper-van and heading up to Kerikeri. We lost three hours at the camper-van company because of a problem with their system, which made us arrived in Kerikeri mid afternoon instead midday. We headed straight for The Stone Store and Kiroripo Pa. A beautiful area along the Kerikeri River. We spent a couple hours there then visited the Rainbow Falls (Waianiwaniwa) a little farther upstream. Unfortunately that’s all we had the time to visit. The next day we were off to Paihia. 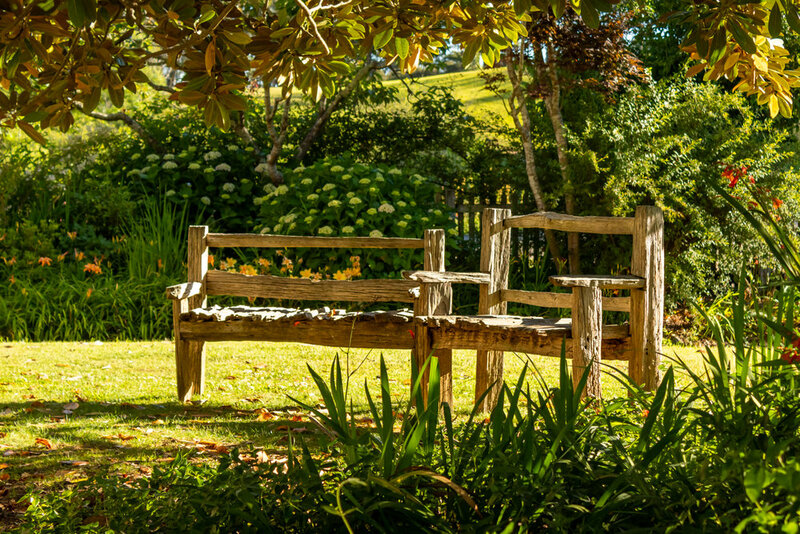 Kerikeri is a large town with plenty to visit and do, and absolutely beautiful. Well worth a visit. So for those who have seen my last video and are back, either it wasn’t that bad (I don’t believe that for a second) or you like to be tortured (naughty you). Well there could be a third option, that you’re interested in seeing how bad these videos can get (the option I would bet on). Nonetheless, welcome back to you and the newcomers! Today we pickup our camper-van and make our way north to Kerikeri near the Bay Of Islands. 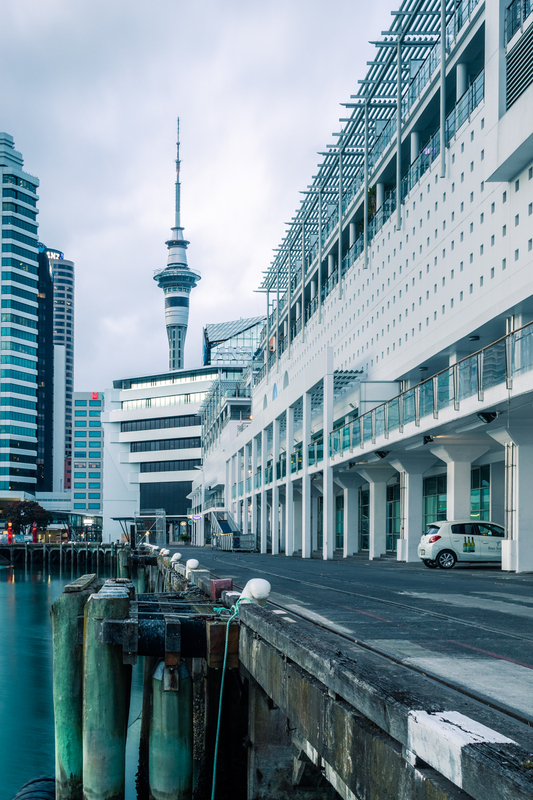 I got up early to head down to Viaduct Basin near Downtown Pier 4 for some photos. It was an overcast morning with some breaks in the clouds on the horizon. I came away with two though. One of The Cloud convention centre and the other of the Sky Tower. Afterwards I went for a walk on Queen’s Wharf around The Cloud before heading back to the room. I was getting hungry and the others would be getting up soon. Finding a place to eat at 7:30 in the morning on a Sunday was more difficult than we thought. Everything was either closed or opened around 8:30-9 o’clock. Except for The MLC Cafe & Bar, just down the road from us, who open there doors at 7 am. The coffee, food and service was great. I can highly recommend it. After brekky it was time to pickup our camper-van. We thought it would take about a half hour to have keys in hand but it took a little longer… three hours! Yep, no joke. They apparently had a glitch with their system. We had planned to arrive in Kerikeri around 12:30-1 o’clock but we were just leaving Auckland. No matter, our trip around the North Island of New Zealand had begun. Destination Kerikeri, north of Auckland near the Bay of Islands, with a little stop-over in Kawakawa. A little town at the cross road where you can either head east to Paihia or north-west further up the island. I wanted to visit Kawakawa’s public toilets. Yes, you read me right. But not any toilets, the Hundertwasser public toilets. A beautiful work of art. I’m glad we stopped to check the toilets out because we would never seen the rest of the art works in this little town. Well worth a stop-over. Moving onward, we’d planned to stop by a couple of wineries, a cheese factory, a chocolate factory and a honey boutique… but it was Sunday. Everything is closed on Sunday. So we kept going to our next stop, The Stone Store where we would also find the Honey House Cafe and the Pear Tree restaurant. 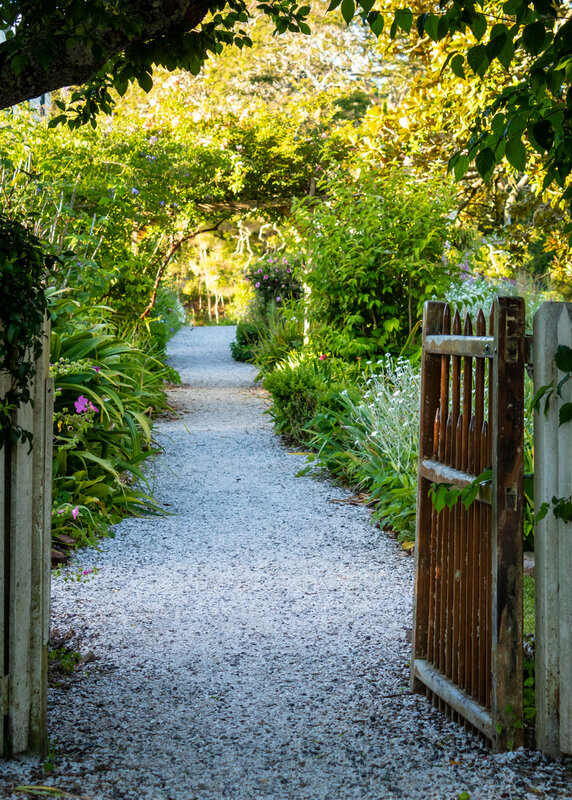 All located along the Kerikeri River and all closed apart from the Pear Tree. But it didn’t matter because the area was just beautiful. We spent some time here exploring and taking photos. It was nearing the end of the day and we wanted to visit the Rainbow Falls before sunset. And beautiful falls they are. I really like one that show the length of the falls. I took one photo from both lookouts and headed back to the camper-van. It was nearing dark and we hadn’t found a spot to stay the night yet. We’d decided to stay at a free campsite tonight and the closes one was in a town called Kaikohe. 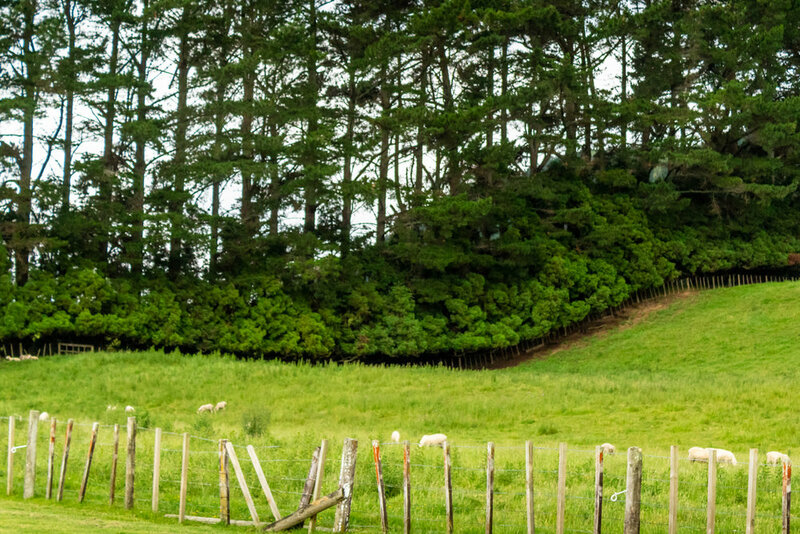 About a forty minutes drive west of Kerikeri. The campsite was just a parking area suited for long vehicles. Well, that’s it for day two. Hope to see you for day three. Goodnight. Before our New Zealand trip around the North Island, I thought I would start videoing my holidays. Maybe not the greatest idea after reviewing the footage but it’s too late now, I’m already back home. Sometimes I’d forget to record and other times I’d record things that were maybe not necessary. I quickly realised that filming on the go can be quite difficult. Nonetheless it was an experience that I will continue and try to improve upon. Well, I definitely have to improve. You’ll know what I mean if you decided to watch the video. Now the video is very basic. There’s no narration or voice-over. That’s partly due to me not being comfortable in front of a camera and the other is, it would have taken me many takes before I would be happy with what I had to express. I’m hoping that will change as I try to improve my videos. The video starts at the backpackers place where we stayed our first night in Auckland. Yes, the video doesn’t start at the airport. I was so excited about the trip and getting to Auckland that I’d forgotten to even take out my phone out of my pocket. By the time we settle in our room it was nearing 6:30 pm. We decided to stroll down Queen Street to the waterfront. Along the way we stopped at Aotea Square for a quick photo of the beautiful arched sculpture. Mistake on my part, I used it for the thumbnail of this video but didn’t include it in the video. A reminder for next time. Then we walked through the night market where we stumbled upon a french patisserie. Once on the waterfront near Viaduct Basin, we settled for dinner at a wonderful restaurant called Frida Cocina Mexicana & Tequila Bar. A must if you’re ever there. We then strolled back up Queen Street to our room. For those of you who are interested, everything was recorded with FiLMiC Pro on my iPhone and edited with LumaFusion on my iPad. They were the most recommended applications I found for filming and editing on mobile devices. Though I’m still in the learning curve, I really like the use of both of these apps. I didn’t have a gimble so the footage is quite (very) jumpy. Sorry about that. 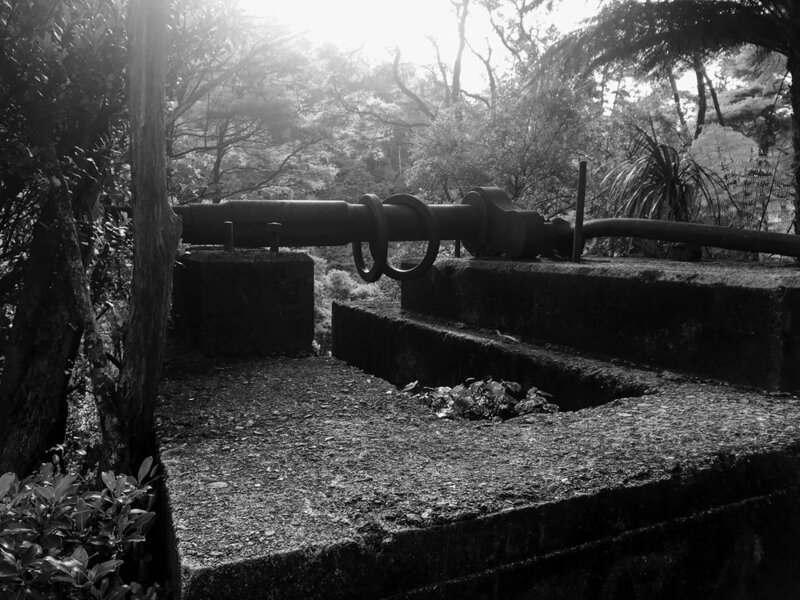 If you haven’t been tortured enough, stay tune for my next video where we head up to Kerikeri. Courbet Place is a section of what most people refer to as La Place Des Cocotiers (Nouméa, New Caledonia). For a number of years now the Council has transformed this place with illuminations for Christmas. I had the chance to visit late on the last night. I rushed around for a composition and took a few photos before the lights turned off. I was actually surprised they hadn’t done so already. This was the last photos taken just a couple of minutes before they did. I got down low to include as much of the arch as possible with the bells on the top third and the Fountain Celeste on the bottom third. The low ISO and small aperture gave me a long exposure of a few seconds. I didn’t want anyone in my composition thus had to wait a few minutes for people to walk out of my composition. I took this shot in the meantime and glad I did as the lights turned off shortly after. I would probably never have gotten the shot I was after so I’m thankful I got this one. I hope everyone had a fantastic end of year 2018 and I wish you all the very best for 2019. Just thought I’d quickly share a photo of Noumea’s (New Caledonia) fireworks from last night. I headed up to the Mobilis tower to take these shots. Not the best idea as I couldn’t get close enough with my 28-75 mm lens. I used an app to trigger the shutter, to avoid touching the camera, but that too wasn’t a great idea either. My hands were wet from the rain which caused problems with the touch screen. I’m going to have to get a wired trigger release, I find them more reliable and easier to use. I put the camera in BULB mode and triggered the shutter on and off as I saw the fireworks explode. I took around sixty photos and this was only one that I really loved and successfully captured.